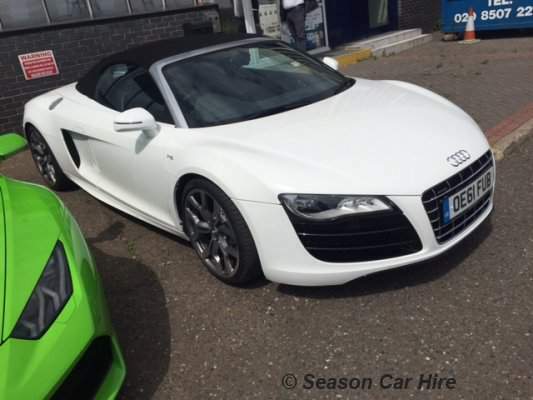 Notorious for its sleek design and exhilarating power, the Audi R8 Spyder is one of the most sought after supercars to date. Available in white with black leather interior, we opted for the 5.0 V10 engine. An unequalled combination of passion, expertise, and determination has helped catapult Audi and their signature four rings into the spotlight as one of the top cars on the market. 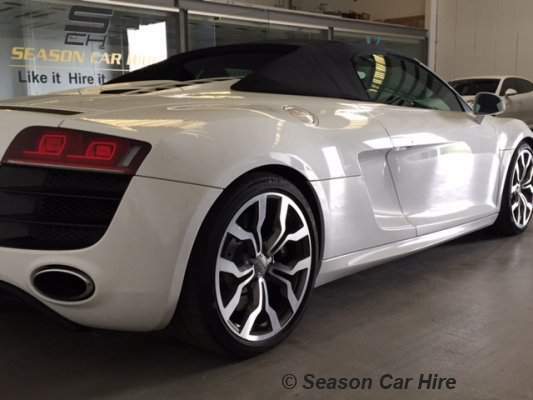 The R8 exterior instantly presents itself as a dynamic sports car. This car is full of design features such as wide air intakes and sweeping side blade. Not only do these features catch everyone's attention but they also serve their own purpose whether it be for enhancing the cars aerodynamic potential or cooling the engine. The engine is extremely high-revving, coupled with a quick-shifting S Tronic 7-speed gearbox and optional Audi magnetic ride equals for a with a stunning performance. 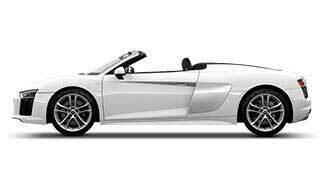 The Audi R8 Spyder is rated at a brilliant 540 horsepower delivered at 7800 rpm.The use of a new dual fuel-injection system that switches between injection as needed for highest levels of efficiency and power. Inside it's rigid yet lightweight aluminium frame, the R8 presents its influence of racing cars, thanks to fine Nappa leather sports seats, driver oriented instruments and a leather (flat bottomed) steering wheel. 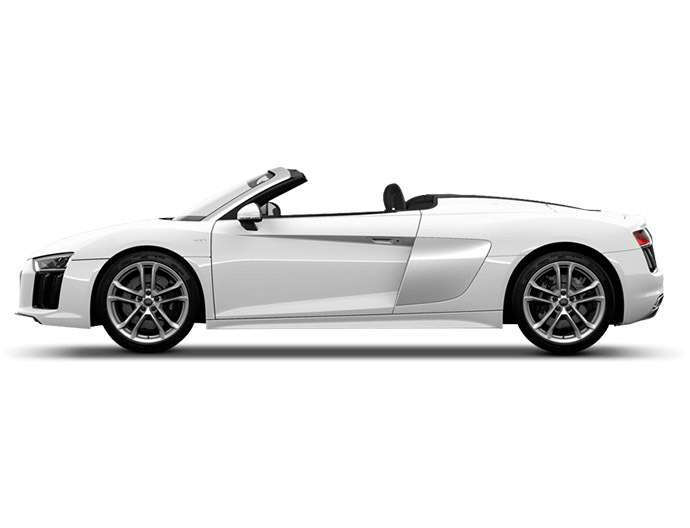 Our wonderful R8 is Spyder which means that it is convertible. 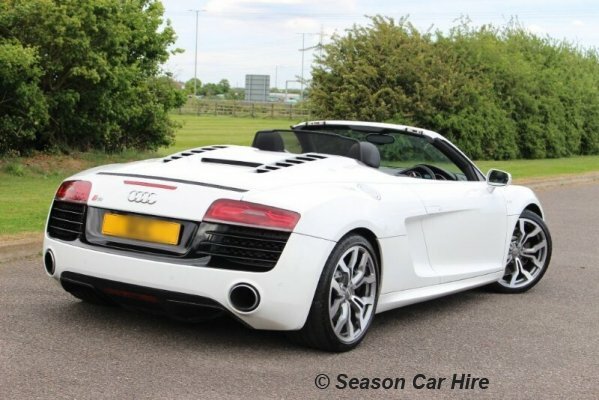 There is nothing more perfect for summer than driving with the roof down in our luxury hire car. The Spyder uses a fabric roof, which can be open/closed in less than 20 seconds even when the car is moving up to 31 mph. The roof is stored below the carbon-fiber engine cover. 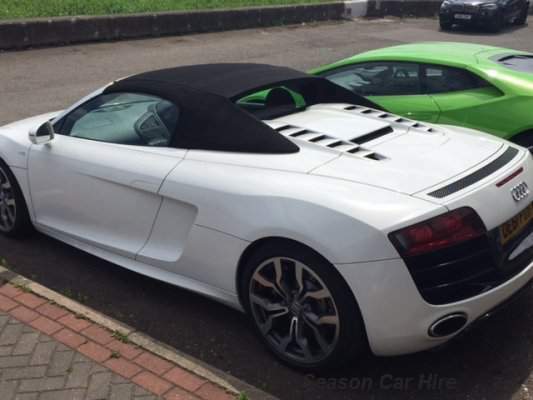 When renting a supercar for long journeys, many people worry about the comfort of the vehicle. Not to worry, the front trunk is very spacious and the interior space is generous despite so space behind the driver's seat. Please note price has 100 miles per day, additional miles can be purchased. 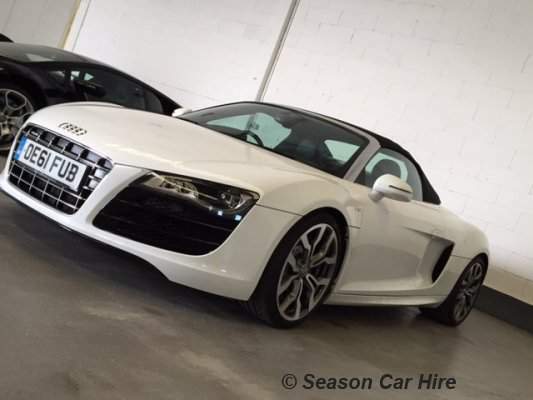 the Audi R8 is one of luxury car rental London fleet. 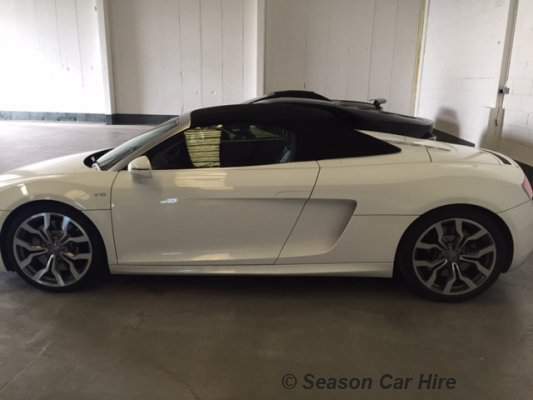 What is needed to rent a Audi R8 Spyder? A security deposit of £3000 is required via debit or credit card.